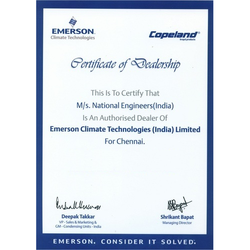 Established in the year 1989, we, National Engineers (India) are one of the leading authorized wholesale dealer, trader, and distributor of a quality range of Scroll Compressors, Danfoss Compressor, and Commercial Ventilation System. Our products are appreciated for features like long service life and low power consumption. We are exporting our products all over the world. Our products are quality checked at our in-built quality testing unit and our warehouse supports us in safely storing them. Owing to our stringent quality measures and policies, we are able to achieve a high level of client contentment. Our organization was established by, “Mr. Pradeep Kumar Bachhawat”, a leader, a visionary and a businessman with ample of knowledge. With his vast industry experience and skills, he helps the organization to achieve the impossible and come out as one of the prominent names in the industry. Our organization is operating with the help of a team of diligent employees who devote every bit of their knowledge and expertise in ensuring maximum satisfaction for the clients. All our employees are highly qualified and have years of work experience in the industry. They are adept with the work flow and the process of procurement. It is due to their strategic efforts and sincere approach that we are able to meet the exceeding demands of the clients. Well-defined parameters and set of rules are followed by our team, and our employees function in a series of work steps, towards attaining client satisfaction. A strategic approach towards the quality management has been adopted by our organization in order to supply the products that meet the international level of quality. Under the supervision of our quality experts we conduct rigorous assessment of the products so that we are able to examine any kind of shortcomings related to the received or supplied products. We send our procuring agents to the clients for examining the products performance and working. Further, to be more specific regarding the product quality, we conduct tests in our own quality laboratory. Our success as a reputed stockist, trader and wholesaler is a result of our years of hard work and commitment. Our dedicated employees are determined to achieve maximum client contentment with their efficiency. We ensure that our products and services are no less than excellence, and exceed clients' expectations.